On the 34th day in the life of the most beautiful girl in the history of the world the morning began peacefully. It had snowed over night and continued to snow throughout the day. When I woke up I went to pick Maya up from her bed. She was awake. Awake in her bed looking around the room. She was on her own and doing fine just observing the room. Her eyes were as wide as i have ever seen. Most of the time when she wakes up her eye lids stay relaxed. This morning they opened wide enough to add a few wrinkles to her forehead. Little wrinkles that just have to be kissed causing her to either blink her eyes or look up further to see who was pecking her on the forehead. We moved into the living room and opened up the shades as we do every morning and looked at all the snow. The snow was several inches deep and still piling up. Me and Maya stood their and looked out the window. Actually Maya didn’t stand. Thats not really her thing. Maya has become quite a strong and confident little girl. Last night, much to the dismay of grandma, she only wanted to be left in her bed. Every time grandma would pick her up she would squirm. When she was laid down she went right to sleep. She likes to comfort herself. All she needs is one hand out to reach up to her face and she is good. 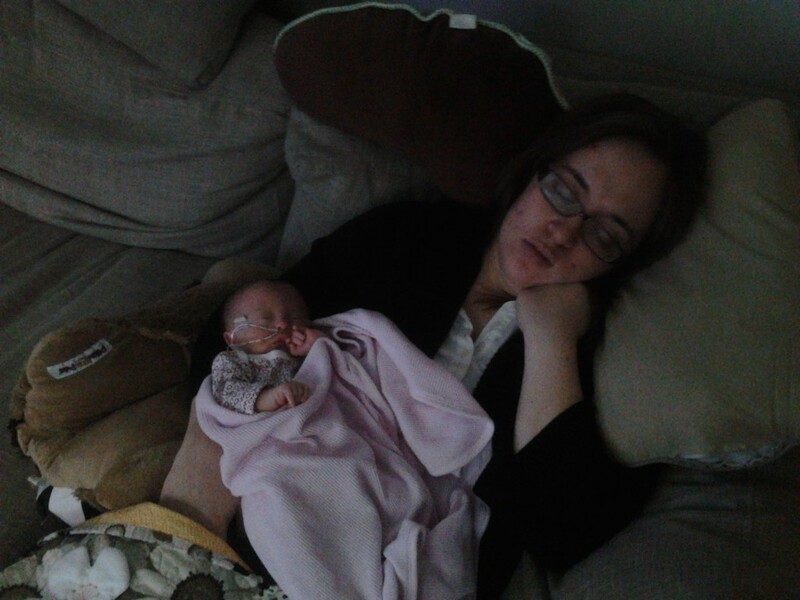 She has taken to sucking on her nuckle, or placing her hand against her cheek and drifting off to sleep. In the evening Bonnie came by to bring us an excellent dinner. We enjoyed it tonight and Maya will enjoy it in a few days. Kathy is here tonight and is holding Maya on the couch as I write. The snow is still piling up. We are nice and warm inside watching tv. How precious is the picture! We know where Maya gets how she likes to sleep. :) I’m glad you 3 had such a wonderful 1 month bday celebration! Everyday I check to get my Maya fix. I just love to hear all about her day and what you all did. Thanks for the great blog. The pictures are great too!